Upon hearing that their child needs to have one or more teeth pulled, many parents might feel a little nervous. It can be hard to watch our children undergo medical or dental procedures, and when the time comes for your child to have teeth pulled, you might not be certain of the best post-extraction care techniques. In today’s post, we’ll review a few reasons why your kiddo might need to have teeth pulled and what you can do to help him or her through the recovery process. Are you looking for a fun and affordable kids dentist in Seguin? Alligator Dental is here for you, providing patient care procedures with gentle hands to ensure your child’s smile is bright and healthy for years to come. Contact our office at 830-372-3725 or schedule your appointment online today! Why Do Children Need Teeth Pulled? While there are many reasons your child may need a tooth pulled, there are a few that are more common than others, including some dental health concerns and as preparation for future treatments. Excessive decay — If your child’s tooth is decayed enough that it cannot be saved by a root canal procedure, the dentist may recommend extraction. Fracture — In situations where a tooth has sustained damage that is not repairable, such as a severe fracture, extraction may be necessary. Crowding — Teeth that are too close together can cause headaches, jaw pain, and increased rates of decay. When this situation occurs, extraction may be needed. Preparation for braces — When children need braces, teeth may be pulled so that other teeth may move into their proper positions. 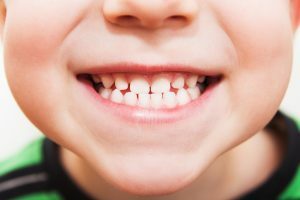 If your child has complained about his or her teeth hurting, or if he or she is experiencing teeth crowding, it is worth a phone call to a kids dentists in Seguin. At Alligator Dental, our friendly staff is happy to speak with you about any pediatric dentistry concerns that you have. Contact us today! After the extraction, the dentist will instruct your child to bite down on a piece of gauze at the site of the extraction to stop bleeding and promote clotting. If bleeding continues to be a problem after you get home, repeat this procedure and change the gauze every 20 minutes or so. If bleeding persists, contact our office to alert the dentists. When a tooth is pulled, your child’s oral cavity will respond to the event as it would an oral trauma. This means that your child may experience a sore jaw, swelling, and other discomforts in the days following an extraction. To ease the pain associated with inflammation, try placing an ice pack or frozen washcloth on the swollen area for 15 to 20 minutes at a time. You may also use over-the-counter pain medication if a prescription was not prescribed by the dentist. After an extraction, the surrounding gum tissue will be very sensitive as it works to heal. It is very important to avoid hard foods that could scratch or poke the extraction site. Likewise, you want to avoid pieces of food getting stuck in the tender gum tissue. To help promote comfortable and speedy healing, give your child only soft foods for the first 24 hours. Additionally, to ensure that the blood clot over the extraction remains intact, your child should not spit or drink out of a straw. It might seem tempting to let your child skip out on brushing and flossing after an extraction to avoid dislodging the blood clot that has formed, however, proper dental care is just as important now than it was before. Your child should continue with his or her normal routine of flossing and brushing, but should do so very gently, being careful to avoid the extraction site. If there are any concerns, or you see excessive blood in the sink, call the staff at Alligator Dental right away. Are you concerned that your child has a decayed or fractured tooth that needs to be pulled? Does your child appear to be experiencing excessive crowding in his or her mouth, or have you been advised by an orthodontist that extractions are necessary to accommodate braces? 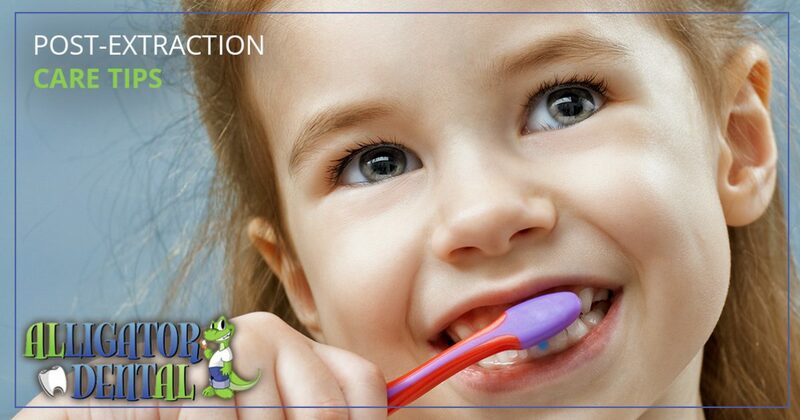 If so, or if you have any other dental health concerns for your child, Alligator Dental is here to help. Our team of kids dentists in Seguin perform quick and gentle extractions every day, and we are happy to answer any questions that you have about the post-extraction care recommendations above. Call our team at 830-372-3725 today!